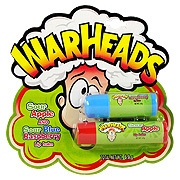 Deliciously flavored Warheads candy lip balm in Sour Apple and Sour Blue Raspberry. Apply to lips. Reapply as desired. Warning: Choking hazard. Not intended for children under 3 years old. 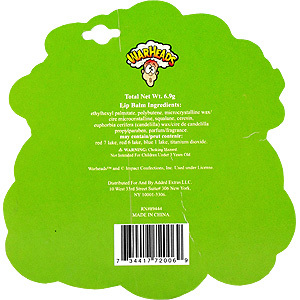 ethylhexyl palmitate, polybutene, microcrystalline wax/cire microcristalline, squalene, ceresin, euphorbia cerifera (candelilla) wax/cire de candelilla propylparaben, parfum/fragrance. 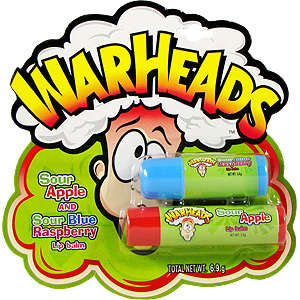 Warheads Lip Balm Sour Apple & Sour Blue Raspberry is shipped in a discrete, unmarked package. Orders are processed immediately and usually take about 3 to 5 working days to be received. We do ask that you try it for 2 to 3 weeks to feel the full effects. Any information received is used only for order processing and shipping purposes. Your information, such as e-mail address, will never be disclosed to a third party.